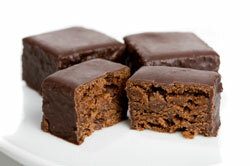 If you're craving something chocolatey...this Hershey Brownie Recipe fits the bill! Who better understands the world of choclate than the Hershey's company, so it was only natural for me to search out an easy brownie recipe on their website. What I wasn't expecting was a "two for one" chocolate fix! The creamy brownie frosting is literally the "icing on the cake"....or brownie! So it's off to the kitchen I go to whip up a batch...why not join me? Then you can send me a note about how your Hershey brownie recipe turned out. (Or share your version with us). 3. Bake 20 to 25 minutes or until brownies begin to pull away from sides of pan. Cool completely in pan on wire rack. Prepare CREAMY BROWNIE FROSTING; spread over brownies. Cut into squares. About 16 brownies.